HomeUncategorized Have things changed at all? Have things changed at all? SPRINGBOK spearfishermen, anglers, leading conservationists, marine biologists, members of the tourist industry and the big Cape boat clubs this week united in a call for the establishment of an underwater ‘Kruger Park’ in the Cape. MAN has ravaged the land, killed the animals and fouled the air. But he has also learned to conserve. Vast areas of wilderness are set aside all over the world for national parks to preserve the world’s natural heritage. Now it is the turn of the sea. We are devastating the sea at an alarming rate. The Cape, with its proximity and dependence on the sea, can play a vital role in preserving the oceans and their creatures. 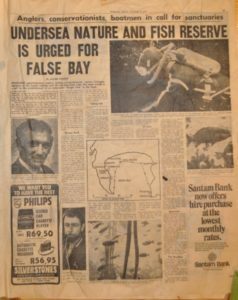 The False Bay Conservation Society has been working on the idea since 1969. They have been preparing a case to put before the Department of Sea Fisheries. And a call by Springbok spearfisherman Laurie Plumbridge this week got the ball rolling among the diving fraternity. Springboks Tubby Gericke, John Hughes and Arthur Ridge, as well as the manager of the first Springbok team to tour overseas, Mr W. Pengelley, are all for it. Marine Biologist s Dr N MIllard of the South African Museum, Dr John Field and Mr Peter Zoutendyk of the University of Cape Town and Professor J.H. Day have added their support. A circle of 1500m in diameter, with Roman Rock as the centre, is the site suggested by the False Bay Conservation society for the first sea nature and fish reserve. It suits the needs and desires of everyone concerned. Roman Rock is just outside Simonstown Harbour. A reserve there would protect a large variety of reef and bottom fish, as well as a host of marine flora and fauna. Easily accessible to small boats, the reef is not fished enough to cause great deprivation to anyone. But it is in danger and preservation of the life in it could have far reaching effects on the rest of the bay. There are also numerous places nearby that could be encompassed easily by a reserve. And the area can be easily policed. Policing an undersea reserve is difficult. When Dr A.V.Hall, chairman of the Co-ordinating Council for Nature Conservation in the Cape, approached the Department of Sea Fisheries about the possibility of a reserve at Roman Rock he was told the department was already overworked in policing established crayfish and netting reserves. But the many boats of the Cape Boat and Ski Boat Club as well as those of the SA Marlin and Tuna club, and the Cape diving clubs pass the area frequently. They have all agreed to do the patrolling. Why establish a reserve in the first place? Commercial and private fishing is taking its toll on the marine life of the bay. But the extent of the damage is difficult to estimate. ‘Both from the point of view of a scientist and management a reserve is desirable,’ Dr John Field, a marine biologist at the University of Cape Town, said ‘Roman Rock would give us a base to study and observe a reef recover. When it reached optimum point we would have yardstick to compare if other places had a crisis or were ever exploited. ‘Studies over time would enable us to check on and measure seasonal fluctuations. Dr N. Millard of the South African Museum said it would take at least 10 years for life to build up in a sanctuary. She would like to see the shore included in the reserve as well. The effect of this kind of reserve is often dramatic. Mr C. Booth, a diver and taxidermist at the South African Museum, described the effect of the crayfishing ban at Clifton. ‘When I was a youngster we used to take kreef out at Clifton. The commercial interests cleaned the place out. It was made a sanctuary and the crayfish are coming back. I’m just a layman, but I think sanctuaries are a good idea if they are controlled properly. Stopping trawling close to shore has a good effect on False Bay, according to Mr W. Pengelley, chairman of the Western Province Underwater Union. He thinks reserves like Roman Rock would be good, but the ban on fishing must apply to rod anglers as well as spearfishermen. ‘We would be happy to back a reserve where people could go and ‘goggle’. It would be a big tourist attraction’ he said. In fact, there is already a diving concern that is planning to bring in overseas tourists, as well as local people, to go on diving trips around the Cape coast. They have had a number of enquiries from overseas, particularly Europe. With the overcrowding of the Caribbean, and the lack of fish and pollution in the Mediterranean, this could mean a tourist boom for south Africa in this lucrative field. And a reserve would be one more attraction. There is already an underwater trail for amateur divers at Tsitsikama Coastal National Park. It can easily be followed by people using only a mask and a snorkel. Many people believe that the same thing could be done at a place like Miller’s Point. Springbok diver Tubby Gericke thinks Miller’s Point would be an excellent place for a sanctuary. ‘It’s easy to police, there’s a camp site, clubs could do marine projects and also it would stop people from taking things out of the sea there. The spearfishermen have the most to lose by the establishment of a sanctuary. Few divers can go below 3m without an aqualung and no club diver ever fishes with breathing apparatus. But they want the ban in reserves to be for everyone. Reserves are the only way to control line fishermen, and it is fishermen in boats who bring up small fish. ‘A reserve would the fish time to get big.’ There are many fish like the red roman being taken when they are under three pounds, so they don’t get a chance to mature,’ another springbok , Arthur Ridge, said. Conservation is part and parcel of club activities of spearfishermen and divers. ‘Most of the clubs have been conservation-minded for years,’ Arthur Ridge said. Laurie Plumbridge would like to see the area from Glencairn to the Boulders declared a reserve. He is concerned with the possible depletion of the seas. ‘The area contains a number of good reefs, and would be ideal for sea life to regenerate itself,’ he said.